By Mathieu Sabbagh, D.O., Dennis P. Vollman, D.O., Benjamin L. Viglianti, M.D., Ph.D.
A 45-year-old man presented to nuclear medicine for evaluation of hyperthyroidism with a desire for definitive radioiodine therapy. 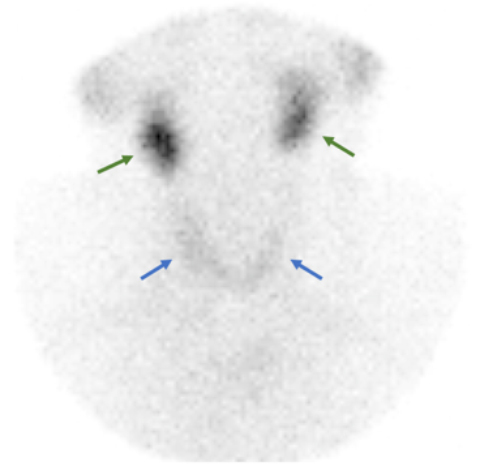 Thyroid scintigraphy using Tc-99m pertechnetate (Figure) was performed and revealed diffusely decreased uptake of the radiopharmaceutical compared to the salivary glands. No focal nodule was identified. The 24-hour I-131 uptake was 1.7%, which is below the normal range of 7.5% to 25%. Subacute thyroiditis is the most common cause of thyrotoxicosis in the setting of decreased radiotracer uptake on nuclear medicine studies. Subacute thyroiditis can be further classified as granulomatous thyroiditis (deQuervain’s thyroiditis), silent thyroiditis, and postpartum thyroiditis. Regardless of the subtype, thyroid inflammation results in the release of thyroid hormones with the expected symptoms of thyrotoxicosis. This elevation suppresses TSH and leads to a subsequent phase of hypothyroidism. Ultimately, the patient returns to a euthyroid state. Therefore, subacute thyroiditis is generally considered self-limiting, resolving within weeks to months, and nuclear medicine radioiodine therapies are not indicated.2 Management is usually handled by endocrinologists and/or primary care specialists, and treatment typically focuses on symptom relief. In this case, although the patient presented clinically with symptoms indistinguishable from Graves’ disease, the thyroid uptake and scan did not support this diagnosis. Therefore, other causes of hyperthyroidism that would have decreased thyroid activity on nuclear medicine studies were considered. Among the differentials discussed above, the final diagnosis is largely based on clinical history, as tissue sampling is not routinely performed. In this case, a diagnosis of a subacute thyroiditis was made. The most important duty of the imager is to recognize and alert the clinician of diagnostic possibilities other than Graves’ disease as the cause of the hyperthyroid state. Nuclear medicine radioiodine therapies for hyperthyroidism are indicated for Graves’ disease and hyperfunctioning nodule(s). Performing a radioiodine therapy in this patient would have been inappropriate given 1) the self-limiting nature of most cases of subacute thyroiditis, making a permanent ablation of the thyroid gland unnecessary; and 2) the extremely low 24-hour thyroid uptake value that would require an unreasonably high dose of I-131 for a successful ablation. Because it is common, Graves’ disease is the initial primary diagnostic consideration in patients with thyrotoxicosis. However, clinicians and imagers must be cognizant of other causes of thyrotoxicosis as the treatments are different. Encountering a hyperthyroid patient with depressed findings on scintigraphy suggests a process other than Graves’ disease. Subacute thyroiditis, as well as other rarer causes of thyrotoxicosis, are uncommon but are important disease processes for imagers to be aware of to avoid inappropriate and ineffective radioiodine therapies. Intenzo CM, dePapp AE, Jabbour S, et al. Scintigraphic manifestations of thyrotoxicosis. Radiographics 2003;23(4):857-869. Ziessman HA, O’Malley JP, Thrall JH, et al. Endocrine System. In: The Requisites: Nuclear Medicine, 4th ed. Philadelphia, PA: Saunders; 2014: 66-97. Ross DS, Burch HB, Cooper DS, et al. 2016 American Thyroid Association Guidelines for Diagnosis and Management of Hyperthyroidism and Other Causes of Thyrotoxicosis. Thyroid 2016;26(10):1343-1421. Volpé R. The management of subacute (DeQuervain’s) thyroiditis. Thyroid 1993;3(3):253-255. Intenzo CM, Capuzzi DM, Jabbour S, et al. Scintigraphic features of autoimmune thyroiditis. Radiographics 2001;21(4):957-964. Tsang W, Houlden RL. Amiodarone-induced thyrotoxicosis: a review. Can J Cardiol 2009;25(7):421-424. Sabbagh M, Vollman DP, Viglianti BL. Decreased Thyroid Activity in a Patient with Hyperthyroidism. J Am Osteopath Coll Radiol. 2018;7(1):29-31. Mathieu Sabbagh, D.O., Dennis P. Vollman, D.O., Benjamin L. Viglianti, M.D., Ph.D.